Mayor Breed at the ribbon cutting ceremony for the completion of the Polk Streetscape Project. 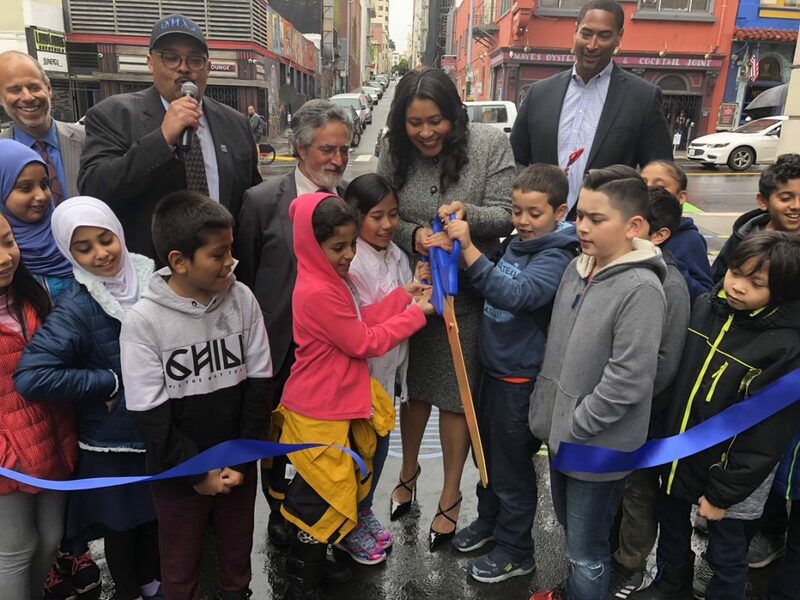 SAN FRANCISCO—On April 2, San Francisco Mayor London Breed was joined by safe streets advocates, merchants, neighbors and city leaders to celebrate the completion of the Polk Streetscape Project. The project improves safety for those traveling on Polk Street and enhanced the character of the region by improving lighting, landscaping and street infrastructure. According to the Mayor’s Office, the transformative 1.8-mile project stretches along Polk Street from Beach to McAllister Streets. Polk Street has some of the highest bicycle and pedestrian collision rates in San Francisco. On average, one person walking and one person cycling are hit by a vehicle each month on Polk Street—122 over a five-year period—and the region has been prioritized for safety improvements under San Francisco’s Vision Zero initiative, which aims for eliminating traffic-related fatalities by 2024. Construction on the two-year, $26.8 million project started in October 2016 and the majority was completed in December 2018, with final work completed in April. Planning for the project started in August 2012 and included a two-year public engagement process that consisted of more than 60 meetings with residents, merchants, community groups and advocacy organizations. The Polk Streetscape Project includes numerous safety enhancements and utility improvements, including 30 blocks of improved bike lanes, 136 new street trees, more than 3,800 linear feet of upgraded sewer main and over 5,700 linear feet of upgraded water main. The project improved 160 curb ramps to bolster ADA accessibility; upgraded traffic signals at nine intersections; installed 81 new street lights and refurbished 31 existing lights; and resurfaced the entire stretch of roadway. For the Fern Street Art Alley, San Francisco Public Works’ landscape architecture team worked closely with the Lower Polk Community Benefit District and Lower Polk Neighbors to identify and choose nine art-centric quotes that were incorporated into the design of the decorative pavement inlay. “The Lower Polk Community selected a diverse range of meaningful quotes from notable art and creative icons,” said Christian Martin, executive director of the Lower Polk Community Benefit District. For more details on the project, visit https://www.sfpublicworks.org/polk.